This week, academics from Bangor University will lead an expedition to the Himalayas as part of a research project to investigate altitude related illness. Researchers Dr Samuel Oliver and Dr Jamie Macdonald, PhD student Gabriella Rossetti and undergraduate Sport Science student James Pollard - all from Bangor University’s School of Sport, Health and Exercise Sciences - will be part of the 55-strong team comprising of medical doctors, scientists and mountain rescuers, who will embark on the expedition on the 20th March, returning on the 25th April. In preparation for the expedition the team has already completed numerous baseline tests in laboratories at Bangor University’s School of Science, Health and Exercise Sciences, including resting and exercising tests on cardiac, lung and brain functions as well as testing participants sleeping patterns. MEDEX has been completing these types of research expeditions since 1994. Dr Jamie Macdonald and Dr Samuel Oliver have been involved with MEDEX previously for their expedition in 2008 to the Himalayas and Nepal. Any updates from the expedition will be shared on Twitter @SportSciBangor. “To me this is as cool as science can get,” she said. “It’s such interesting research, finding out how the human body manages to cope in extreme environments and conditions and discovering how the body then overcomes those difficulties. “It is a fantastic opportunity as a PhD student to be involved with such an important research project that will enable us to educate mountaineers, trekkers and their doctors about the nature and avoidance of altitude related illness. Gabriella, is a former pupil of St Mary Redcliffe & Temple Secondary School, Bristol. 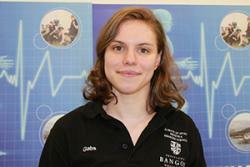 She completed both her undergraduate and Masters degrees at Bangor University. Her undergraduate course was BSc Sports Science (Outdoor Activities), and she then went on to complete a a Masters by research (MRes) within the School. She is now studying for a PhD in High Altitude Health & Performance. James PollardJames Pollard, 21, from Oxford, feels lucky to get the chance to be involved in such a major expedition. “Almost everyone who is taking part in the expedition came up over two weekends for the lab testing, where we were doing the baseline tests for all the different research projects that will going on out there. “My role when we’re in the Himalayas will be helping out with the research and especially making sure that everything is set up properly when we get to base camp. James previously studied at D’Overbroekck’s Sixth Form College, Oxford before completing the HND Sports Science (Outdoor Recreation course) and progressing onto the BSc course at Bangor University. In his spare time, he’s previously done some climbing and a lot of hill-walking, and is also involved in the Canoe Polo club at University. James will also be following in his father’s footsteps on the expedition to the Himalayas. His father, who is a Professor at Oxford University, has previously been part of a Medex research expedition to the region and published research into high altitude medicine.